Washington Monthly | Can the Mighty US Military Save Embattled PARCC? Can the Mighty US Military Save Embattled PARCC? 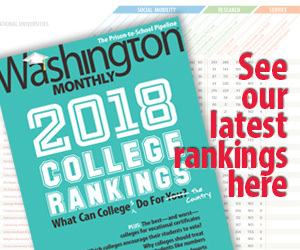 All standardized test makers have been under extra scrutiny in the last year, but few have been beaten up more than the Partnership for Assessment of Readiness for College and Careers (PARCC), one of two groups tapped by the federal government to make tests aligned to the Common Core. So far 19 of the 26 states that signed up for the PARCC test have dropped it, and just last week, the Massachusetts education commissioner Mitchell Chester, who fought to bring PARCC to the state in the first place, said he wouldn’t recommend that the state uses the tests next spring. But PARCC also got some good news last week. The Department of Defense Education Activity (DoDEA) announced that, starting next year, they would administer PARCC tests at their 172 schools across the globe, suggesting the test may not be doomed after all. While the other federally endorsed Common Core test maker, Smarter Balanced, has also lost states, they have lost fewer. It’s not that Smarter Balanced is a better test than PARCC, Common Core watchers say. The more likely reason for PARCC’s troubles is different politics in PARCC and Smarter Balanced states. Related: Will a decline on the Nation’s Report Card hurt Common Core? This past spring, 11 states and the District of Columbia gave PARCC, while 16 gave Smarter Balanced tests. Smarter Balanced will lose Wisconsin and Missouri in 2016, while PARCC will lose Louisiana, Mississippi, Arkansas and Ohio. Morgan Polikoff, assistant professor at the Rossier School of Education at the University of Southern California, thinks PARCC might also face a battle in Maryland, after the state was the only one to see falling scores on all four National Assessment of Educational Progress (NAEP) tests – which are considered the gold-standard for student standardized tests. If both Massachusetts and Maryland drop out, that would leave just five states and the District of Columbia. But PARCC officials contend that there is no state or student minimum needed for the tests to work. As proof, they point to the New England Common Assessment Program, which served just four small New England states for nearly a decade. Deven Carlson, assistant professor of political science at the University of Oklahoma, thinks politics will continue to be PARCC’s biggest foe. Neither Carlson nor Polikoff think the addition of the Department of Defense Education Activity is going to change the image or fate of PARCC much. Polikoff just hopes that if more states opt to throw out PARCC or Smarter Balanced, legislators give their education departments more time to build new tests. This story was produced byÂ The Hechinger Report, a nonprofit, independent news organization focused on inequality and innovation in education.Â Read more aboutÂ Common Core. Emmanuel Felton is a staff writer. Prior to joining The Hechinger Report, he covered education, juvenile justice and child services for the New York World. He received a bachelor’s degree from Emory University and a master’s from Columbia University’s Graduate School of Journalism.